In September 1983, the Riverview Town Council appointed Mr. T.H. Prescott and Mrs. Shirley McConnell to act as joint chairpersons of the Riverview Bicentennial Committee. This Committee, which included Jere McCabe, Brenda Prescott, Shirley Margeson and Barbara Delahunt, was given the responsibility of organizing and implementing all aspects of Bicentennial celebrations in Riverview in conjunction with New Brunswick's Bicentennial celebrations. One of the projects proposed by the Bicentennial Committee was a history of the area and a record of the orderly development of the Villages of Bridgedale, Gunningsville and Riverview Heights, which led to the development of what is now the Town of Riverview. Financial assistance was approved by New Horizons as requested, making the project possible, for which the residents of Riverview are most grateful. The Riverview Historical Association was fortunate in acquiring the assistance of Alexander Pincombe, a prominent New Brunswick historian, to organize the data which has been collected and edit the manuscripts for publication. To Mr. Pincombe we owe our gratitude for the very valuable contribution he has made to this work. 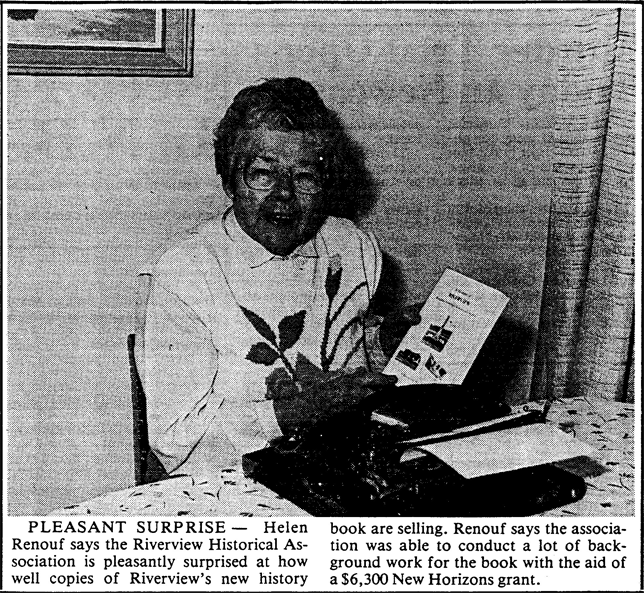 Many of the documents, photographs, plans and information from which this book was written, has been placed in the Riverview Library for safe-keeping and future reference. It has been a privilege to serve as editor of this book. The Riverview Historical Association has made a very serious effort to provide a concise account of the development of the three communities which became the Town of Riverview, together with a broad picture of the many features and activities of the area, past and present. Our readers are encouraged to use the Bibliography and the Archives of the Association, which are located in the Riverview Public Library, for further information and study. It is my earnest hope this history will become a source of pride and knowledge for old and young alike. I wish to acknowledge with deep appreciation the assistance of Betty Savoie and Debbie Rinzler in the preparation of the manuscript, Mona Scott for revision to the text and Ruth Ambrose for photocopies. I am most grateful to Helen Renouf without whose constant support this book could not have been completed.